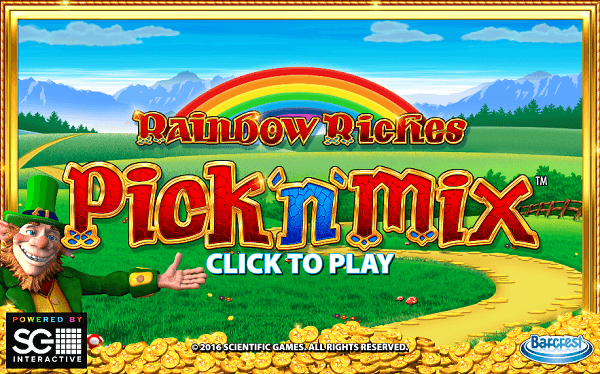 The Rainbow Riches Pick n Mix is the ultimate modification of the already famous Rainbow Riches video slot. The Irish theme has not changed much with cheery tunes, jingling in the background and the wild-eyed leprechaun appearing on all the five reels. The graphics and looks might be the same, but this beast is on steroids. 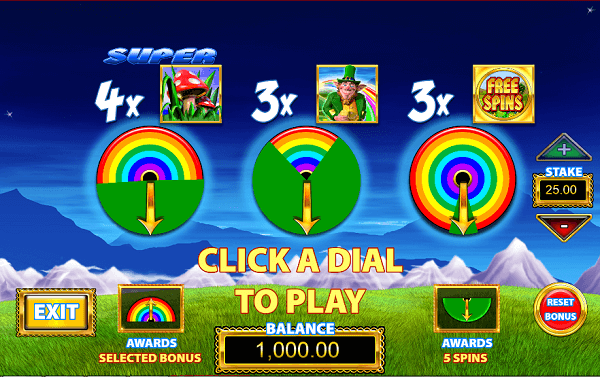 You may need to try the original Rainbow Riches slots before advancing to this amazing machine. The first one is good for players who want to play for fun. It will keep you smiling and coming back for more, but if you start your Rainbow Riches career with this one, you will hate slots for the rest of your life. This is the game for the seasoned players with some skills. The game requires some skills; a little thinking and a well thought out strategy. This can be scary for the beginners cause this is not something that is normally said when iOS and Android slots are involved. It is usually a try and spin to win kind of affair, but things are different here. You should bet more than a dollar or Euro per spin, and this is not a joke. No penny games here. This may sound a little too much, and that’s why there is the Monopoly Once Around Deluxe game which begins at 0.15 per spin. You should bet high to have a high return to player rate. With less than 1, you get a low return of 94% whereas a decent deposit of more than 1 gives you a 96% which is quite good. The big bet option gives you returns off up to 98%. You get to spend a 10 per spin and get either five free spins or activate a bonus feature. This option is quite lucrative, but you can decide to ignore it and simply stake big. The bigger you stake here, the more the odds and the higher your chances of winning. The Rainbow Riches Pick n Mix has a lot to offer, and it surely proves that simplicity is the ultimate sophistication. You can pick from five bonus features before whirling the reels. This is where strategy applies. You will be asked to select a maximum of three out of five bonus features before spinning. However, you can decide to choose two or one although three is the optimal number. The best strategy that will assist you to get the massive wins is to obtain two high paying bonuses which will obviously hit more frequently. You simply have to do this since there are only two high paying bonuses to select from. You can also choose the low paying ones, but the free spins are not worth it. You can spend a whole morning playing the game and only manage 10 times your stake. You have to analyze the bonus features and choose the feature that is worth your time and the amount of stake. This is a slot game that will give you more control than other games. It is not an Auto spin kind of game that you spin and win without any involvement. The Wild Symbol is a gold coin which has the power to replace all the symbols in the reel except the bonus symbols. The Big Bet Game is related to the other bonuses that you have to choose from, but there is a little gist of it. There are reasons why you should choose or not choose it. You can decide to stake anything between 10$ and 25$ per spin on one of the wheels. You will have 3 wheels each for one of the bonus features chosen. If you spin the wheel, and it falls on a rainbow, you obtain this bonus feature. If it falls on the green, you obtain five mega spins. The higher you stake, the higher your chances of triggering the bonus features instead of the worthless mega spins. Mega spins are simply the normal spins played at three times the minimum bet whereas the bonuses are played at sixty times the minimum. All this is regardless of your stake amount, so it is risky. If you select this feature, you tend to play a spin the wheel pick me the game and not the actual slot game, and this is definitely not as fun. Which Five Bonus Games are there to Choose From? You can decide to choose one, two or a maximum of three. Three is optimal for variety, but this is a game of strategy hence your winning strategies may dictate your ideal number. Low wins-Free Spins Bonus: when you get three, four or five free spin symbols on reels one, three and five you get to trigger ten twenty or thirty free spins. The symbols are mainly on the first reel, and you can get five scatters in the process. The free spins do not come with anything special although the symbol becomes wild and you get small wins. The Low/Mid Wins-Magic Toadstool is activated by three scatter mushroom symbols, and four will trigger the super magic bonus. 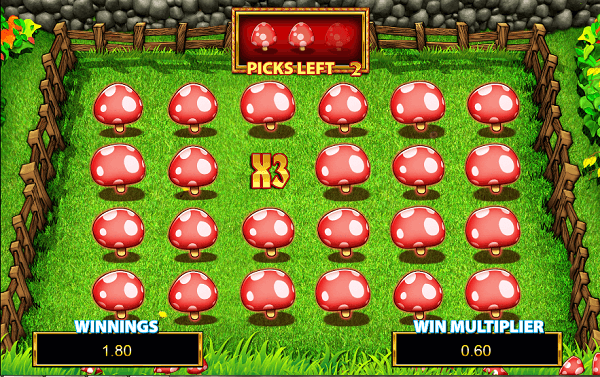 You are first awarded three picks out of 24 toadstools where you either find a multiplier or a fairy. The fairy is the lucrative piece as it uncovers other toadstools around hence more wins. The super magic has bigger multipliers. 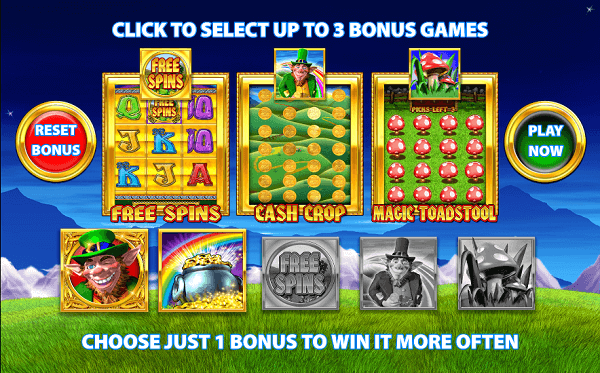 Road to Riches is activated by three Leprechaun symbols anywhere on the screen. You get a path that can lead you to five hundred times your bet amount. You move from one to six spaces or collect. 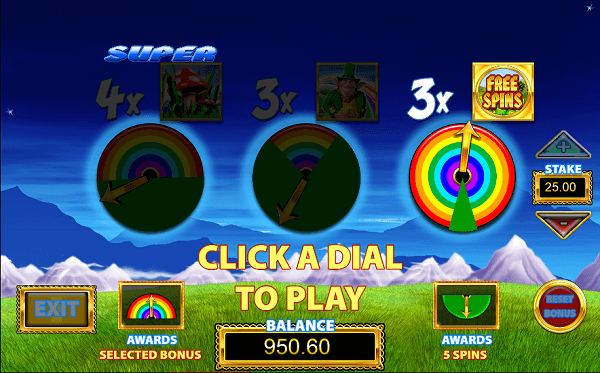 Cash of Crops is triggered when you get three or more leprechauns with a rainbow, and you get an instant bonus. All the coins go round, but only a few have multipliers. Pots of Gold are activated when you get three or more pots of gold symbols anywhere on the screen. The leprechaun gives you gold silver or bronze, and you get awesome multipliers. 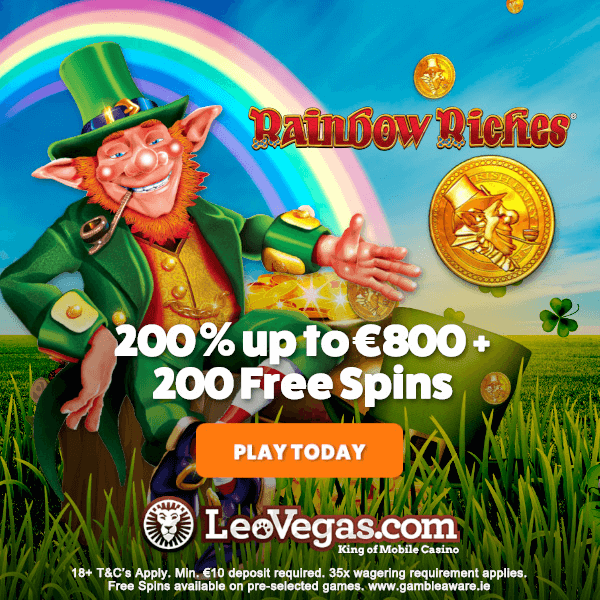 The Rainbow Riches Pick n Mix is an amazing game and a great opportunity to make big wins; play today and enjoy the generosity of the Leprechaun.